Emerald Rangers: Archie's Funhouse. Cartoon Review. 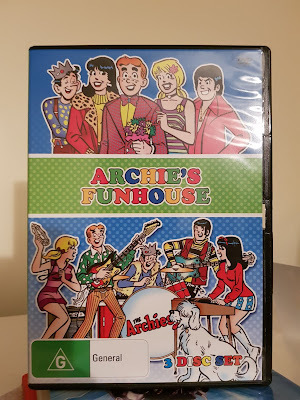 Today we'll be going back to the 1970's where Archie was a lot more wholesome family entertainment than it is now. This is Archie's Funhouse, the fourth animated series starring the Archie gang. This animated variety show has a very unique style of having animated characters performing in front of a live action audience of children. I liked this hybrid style, it flows together pretty well and creates a fun atmosphere. The animated cast that makes this show includes: Archie, Jughead, Hot Dog (Jughead's dog), Betty, Veronica, Reggie, and Moose. Other characters like Ethel, Mr. Weatherbee, Miss Grundy, Dilton and Coach Cleats do appear here and there throughout the show. So, other than that, what is the show about? Why it's nothing but twenty minutes of skits, gags, puns, and cheesy 1960's bubblegum pop music. I could end this review there because that paragraph explains the whole show in a nutshell. I'm not ending the review here, there's other stuff about the show that I want to talk about. The show typically opens up with Archie welcoming the crowd with a themed talent show that has the gang getting into all sorts of hijinks. This segment mostly ends with Reggie about to do something so incredible, so amazing, so spectacular... But he gets cut off because they have ran out of time for that segment. There's the Lightning Round segment where the gang tells jokes and puns in a lightning fast fashion. If I had to compare this cartoon to a modern show to help give you a clear idea, I'll have to compare it to Robot Chicken but not as adult. There's the Giant Jukebox segment which is just the same as the Lightning Round one but full of music jokes and puns instead. Sabrina the Teenage Witch even pops up in the later episodes to teach the viewer some magic tricks. Some of these segments get replaced towards the end of the show. First replacement is the Side Show, a segment that's the same as Lightning Round but with a different name. The other is Little Archie's. Little Archie's is a segment about the Archie gang in elementary school. Another segment that pops up every now and then on the show is Betty's Diary. This segment has her writing down nice things that Archie has said to her in her diary. In reality, Archie is actually saying mean things while Betty is misunderstanding him and thinking he is saying nice things instead. Yeah, that sounds a lot darker than what the segment really is. Speaking of love, you've got a segment where Ethel is trying to trap Jughead because she is in love with him and not the other way around. This segment is full of cheesy Wile Coyote and Road Runner styled gags and would be seen as stupidly sexist by today's standards. Lastly, you've got the Archie's performing music. Yup, enjoy the same few songs over and over, they like to repeat them. Granted, they do give a different music video each time they perform them. Overall, a very basic but fun show that won't be on many peoples radars due to it being a very acquired taste. If you do like stuff that's soo bad that it's good, this will be a show for you. It's also a show that I can't give a score to because it's too bad to score low while also being too good to score high. 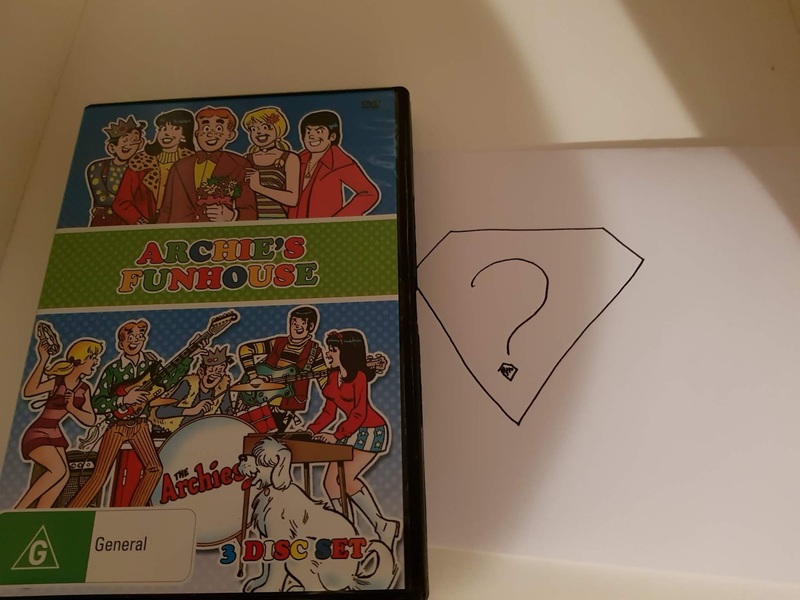 So I'll be giving Archie's Funhouse a ? out of 10. The release I reviewed was the Shock Entertainment release which is a good and cheap way to officially watch this show. Don't expect any special features with this release. It's a very bare bones DVD set. Super Weekend Mode (PS4, Vita) Review. Peasant Knight (PS4, Vita) Review.